I can’t believe it’s been 4 months since my last blog post! Where has the time gone!? Last time I was writing about Christmas Ads and now it’s Easter! This year, I’ve been involved in Creme Egg’s Facebook campaign, so have been in the Easter spirit for a while now! What caught my eye last week was Facebook’s annual F8 developer conference. 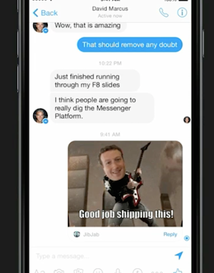 The big news from the event was the focus on opening up Facebook Messenger to businesses. With 600 million active users of Messenger, Facebook is keen to give businesses the opportunity to interact directly with customers. Users will have the opportunity to receive rich information from businesses, including tracking shipping, and purchase information and live chat (one-to-one communication). In the future, Facebook users will have the option of getting receipts for goods purchased online sent directly to Messenger, bypassing email. In the same thread shipping orders will also be tracked. Live chat will make it easier for brands to resolve issues. Chatting with consumers via the newsfeed is not always possible, especially for sensitive / private conversations. Building Apps for Messenger is another way businesses can increase their reach. Currently there are over 20 Apps you can download, from sending GIFS to Memes. I downloaded JibJab, the App Zuckerberg featured at the Conference and had a lot of fun sending GIFS to my partner. I can see many opportunities for brands to develop Apps to engage with fans, for example a Mercedes-Benz ‘Road Trip’ planner, which lets users send driving itineraries to friends, or a McDonalds ‘Meal Selector’, where users can send what they want for dinner. You can also send money to friends using Messenger, so there’s no end to the capabilities of the App! From a marketing perspective the advancements to Messenger are very exciting! Wishing you a safe and relaxing Easter!